Saying About Peak Oil & Why Aren’t You Listening? I realize that I don’t have to introduce Richard Rainwater and Boone Pickens to you two gentlemen, but for the benefit of those who may not be familiar with Messrs. Rainwater and Pickens, following are brief introductions. Richard Rainwater is the Texas based businessman who was chiefly responsible for turning the Bass Family’s inheritance of $50 into a $5 billion dollar fortune. Mr. Rainwater was therefore indirectly responsible for the remarkable urban renaissance of downtown Fort Worth, as a result of the Bass family’s massive investments. Mr. Rainwater also had a material role in George W. Bush’s selection as Managing Partner of the Texas Rangers Baseball Team, which launched Mr. Bush on his way to the Governor’s Mansion and then to the White House. Mr. Pickens, now based in Dallas, has had a long and storied career in the oil and gas industry. Like most Texas oilmen, Mr. Pickens has had his ups and downs. Most recently he has been on an up cycle, via his investment firm, BP Capital. These two gentlemen share an uncanny and proven ability to accurately predict future trends. The only real mistake that I am aware of is Mr. Pickens’ timing regarding natural gas prices some years ago. He was right about the price move, but he was just a little early. Mr. Rainwater was profiled in the 12/14/05 issue of Fortune Magazine, “The Rainwater Prophecy.” Mr. Rainwater is deeply concerned about Peak Oil. In the article, Mr. Rainwater said, “This is the first scenario I’ve seen where I question the survivability of mankind.” Mr. Rainwater first became concerned about Peak Oil after reading “The Long Emergency” by James Howard Kunstler. According to Bill McKenzie, with the Dallas Morning News, the primary reason that President Bush used the “Addicted to OIl” phrase in his state of the Union Speech was the Fortune article about Richard Rainwater, and again Mr. Rainwater became concerned about Peak Oil after reading Mr. Kunstler’s book. Mr. Pickens, via BP Capital, was one of the lead underwriters of the event. Mr. Pickens, several of his associates, and several other notable Dallas businessmen such as Herbert Hunt were at the Simmons/Kunstler symposium, but no one from your respective editorial and news departments were able to make the event--despite multiple notices of the event. In any case, Mr. Pickens has publicly stated that he believes that the world is at peak oil production. Mr. Pickens has publicly suggested increasing the gasoline tax, in an attempt to reduce oil consumption, with offsetting tax cuts elsewhere. I certainly don’t speak for either Richard Rainwater or Boone Pickens, but my impression of these two gentlemen--along with Matt Simmons and Jim Kunstler--is that they are American patriots, in the truest sense of the word, who are trying to warn their fellow Americans about the dangers posed by Peak Oil. 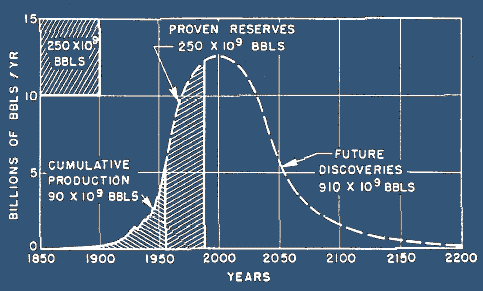 Much of the Peak Oil debate is based on pioneering work done by a famous Texas born geoscientist, M. King Hubbert. My coauthor, “Khebab,” and I wrote an article that was published on the Energy Bulletin website, “M. King Hubbert's Lower 48 Prediction Revisited: What can 1970 and Earlier Lower 48 Oil Production Data Tell Us About Post-1970 Lower 48 Oil Production?” Following is an excerpt from that article. "Fifty years ago this week, on March 8, 1956, at a meeting of the American Petroleum Institute in San Antonio, Texas, M. King Hubbert, in the preprinted version of his prepared remarks, had the following statement, "According to the best currently available information, the production of petroleum and natural gas on a world scale will probably pass its climax within the order of a half century (i.e., by 2006), while for both the United States and for Texas, the peaks of production may be expected to occur with the next 10 or 15 years (i.e., 1966 to 1971)." As more and more people are learning, Lower 48 oil production, as predicted by Dr. Hubbert, peaked in 1970, and it has fallen fairly steadily since 1970. Kenneth Deffeyes, in Chapter Three of his recent book, "Beyond Oil: The View From Hubbert's Peak," described a simplified way of predicting the production peaks for various regions and for their subsequent declines. One simply plots annual production (P) divided by cumulative production to date (Q) on the vertical axis, or P/Q, versus Q on the horizontal axis. Stuart Staniford, on The Oil Drum Blog, has described this technique as "Hubbert Linearization" or HL. With time, a HL data set starts to show a linear progression, and one can extrapolate the data down to where P is effectively zero, which gives one Qt, or ultimate recoverable reserves for the region. Based on the assumption that production tends to peak at about 50% of Qt, one can generate a predicted production profile for the region. The Lower 48 peaked at 48.5% of Qt. Using the HL technique, Dr. Deffeyes, an associate of Dr. Hubbert, predicted that the world crossed the mathematical 50% of Qt mark on December 16, 2005. In other words, Dr. Deffeyes believes that the world is now where the Lower 48 was at in the early Seventies." We used the HL method to predict post-1970 Lower 48 cumulative oil production, using only 1970 and earlier production data. Our work indicated that the HL method was 98.7% accurate in predicting post-1970 Lower 48 cumulative oil production. We need to differentiate between conventional and nonconventional oil. Perhaps the best way to differentiate the two types of oil is to classify it the following way. Conventional--the oil will move to a wellbore on its own. Nonconventional--the oil and oil-like solids have to be surface mined or heated in order to move to a wellbore (or synthesized from lighter hydrocarbons). Dr. Deffeyes estimates that we have two trillion barrels of recoverable conventional oil reserves worldwide and that we have used half of this amount. Fossil fuels can be viewed as a continuum, from natural gas, to natural gas liquids, to condensate, to light sweet crude oil to heavy sour crude oil to bitumen to coal. (Kerogen, a precursor to bitumen, can also be processed to yield oil.) This list is a progression from gas, to liquid to solid. It is also a progression from cleanest, natural gas, to dirtiest, coal. The world wants Liquid Transportation Fuels (LTF’s)--gasoline, diesel and jet fuel. LTF’s can be obtained for the least expenditures of energy and capital from light sweet crude. It only makes sense that light sweet crude will peak before heavy sour, and based on the current historically high spreads between light sweet crude and heavy sour crude, that appears to be the case. The world is increasingly turning toward the endpoints--natural gas/natural gas liquids on the light end and bitumen/coal on the heavy end--in an attempt to maintain and increase our supply of LTF’s. There are several problems. These are hugely capital intensive programs that tend to produce liquids at very low rates compared to conventional oil sources, and on the heavy end there are some fairly severe environmental consequences. Another point that is often overlooked is that every fossil fuel resource, except for kerogen, is currently being commercially exploited. In other words, we are simply talking about increasing our rate of extraction of our finite fossil fuel resource base in a desperate attempt to maintain the current American way of life of driving $50,000 SUV’s on 50 mile roundtrips to and from $500,000 mortgages. Currently, the most significant source of nonconventional oil is the tar sands play in Alberta, Canada, where bitumen is being extracted via surface mining or via the injection of steam into deeper beds. From fossil fuel and nuclear sources, the world currently uses the energy equivalent of a billion barrels of oil (Gb) every five days. The mighty East Texas Oil Field, the foundation of so many Dallas fortunes, the largest oil field in the Lower 48, and the field that was largely responsible for providing the oil to power the Allies victory over the Axis powers in World War II, made about 5.5 Gb. The field is currently producing 1.2 million barrels of water per day, with a 1% oil cut. It took about 75 years to pretty much fully deplete the East Texas Field. In terms of oil equivalent, the Barnett Shale Gas Play in North Texas should ultimately produce, over several decades, on the order of 4-5 Gbe. The world uses, from nuclear and fossil fuel sources, the energy equivalent of the recoverable reserves in the East Texas oil Field or the Barnett Shale Play in less than 30 days. In the 4/2/06 Star Telegram, Automotive Journalist Ed Wallace, in the classified advertising section, wrote a rebuttal to the Peak Oil theories. Mr. Wallace’s two basic points: (1) improved technology will increase recoverable conventional reserves by 50% to 3,000 Gb and (2) nonconventional oil sources will add another 3,000 Gb. Therefore, based on Mr. Wallace’s estimates, we have used 1,000 Gb out of a 6,000 Gb resource base. In the Viewpoints (Op-Ed) section of the Dallas Morning News, similar “cornucopian” energy abundance articles were published last year making basically the same points that Mr. Wallace made. In regard to the technology issue, this assertion is directly contradicted by our experience in Texas (peaked at 54% of Qt), the overall Lower 48 (peaked at 49% of Qt) and the North Sea (peaked at 52% of Qt). Nothing the industry has tried in these regions has reversed the production declines once about half of the oil reserves were consumed. The reason is best illustrated by the East Texas field, now producing water with a 1% oil cut. What can better technology do to help a field that has watered out? In regard to the nonconventional sources of oil, Mr. Wallace is primarily focused on the Canadian tar sands and shale oil (kerogen). The tar sands play is a proven commercial success, that is however hugely energy intensive and that is also yielding vast amounts of contaminated waste water. Mr. Wallace cites the most widely used estimate of 175 Gb in recoverable reserves (note that this should be discounted by about 35% to 50% to get net energy equivalent). He also cited a vague estimate by a Shell executive of 2,000 Gb, that can’t be currently recovered. There is one interesting research program testing some new shale oil technologies, but there is nothing commercial yet. In any case, let’s look at past and current estimates of Canadian tar sands production. In 2003, the US Energy Information Agency (EIA) estimated that total Canadian oil production--driven by increasing tar sands production--would increase by 700,000 BOPD from 2003 to 2005. The reality? Total Canadian oil production fell from 2003 to 2005. The tar sands production fell short of estimates, and the increasing tar sands production the Canadians had could not make up for the decline in conventional Canadian oil production. The Canadians themselves are estimating that tar sands production will only increase to about three million BOPD (mbpd) in 2016 from one mbpd today. Note that we will probably start losing a net two mbpd to four mbpd in conventional oil production per year, starting this year. Again, note that you have to discount the tar sands production by 35% to 50% to get net energy. In effect, Mr. Wallace, and the other energy cornucopians see no problem with the $50,000 Hummer, $500,000 mortgage way of life. Messrs. Rainwater and Pickens disagree. I can’t speak for them, but I assume that they believe that while nonconventional oil will help, it will only serve to slow the rate of decline of total oil production. Some types of ethanol production (not from corn sources) appear have some possibilities, but there are a number of problems. Among the problems is a basic conflict between land devoted to food production and land devoted to fuel production. By the way, the US is probably now a net food importer. Currently, the US uses up to 10 calories of fossil fuels to produce one calorie of food. Ponder the impact on our food supply of a declining oil supply. I realize that US media companies are facing severe economic pressures, and I realize that you are heavily dependent on advertising revenues from the housing/auto industries and from related companies. However, in my opinion we have hit the iceberg. The US media can lash themselves to the sinking ship, by failing to face reality, or you can face the reality of finite energy resources and start heading for the lifeboats. I am supporting a proposal to abolish the Payroll (Social Security + Medicare) Tax and to replace it with an energy tax, principally a tax on liquid transportation fuels. This would unleash powerful economic forces against profligate energy use. Since it is in effect a consumption tax, it would tax those who currently don’t pay the Payroll Tax, by using cash. Instead of taxing payrolls to fund the Social Security and Medicare systems, we would instead tax energy consumption. Alan Drake, a consulting engineer, has written a compelling article advocating a crash program of electrifying our transportation system, with special emphasis on Urban Rail. I am working with a small group regarding the possibility of a Fall symposium on the Energy Tax and Urban Rail proposals, and we would be delighted to have support from The Fort Worth Star Telegram and/or The Dallas Morning News. Note that these two proposals would address: the Social Security/Medicare crisis; the Peak Oil crisis; the loss of farmland due to suburban sprawl and Global Warming issues. We would replace “dumb growth” with “smart growth,” New Urbanism projects along mass transit lines. In addition, I would at least ask you to give your readers a balanced report on the Peak Oil issue. Two leading citizens of your respective cities--Richard Rainwater and T. Boone Pickens--are deeply concerned about Peak Oil. The stated mission of the Fort Worth Star Telegram is: “Earning the People’s Trust Daily.” I assume that the Dallas Morning New concurs with this mission statement. In my opinion, the US media have two choices regarding the Peak Oil issue. To paraphrase Winston Churchill, you can now have either your honor or the status quo. If you do nothing regarding Peak Oil, you will soon have neither the status quo nor your honor. Jeffrey J. Brown is an independent petroleum geologist in the Dallas area.